Today I harvested this year’s very first radish. Very purple and very pretty! The variety is called Plum purple and the colour is just amazing. This entry was posted on Sunday, June 13th, 2010 at 9:24 pm	and is filed under KITCHEN GARDENING. You can follow any responses to this entry through the RSS 2.0 feed. You can leave a response, or trackback from your own site. how beautiful colour has this radish! That’s beautiful. Does it have the same crisp and slightly spicy flavor of regular radishes? Radishes are so good with some butter and sea salt! A very pretty radish it is. Will you plant more throughout the summer? Pille: I agree that the French breakfast are very good! But I do enjoy the different colours. D: It tastes just as normal radish, ie a bit spicy. 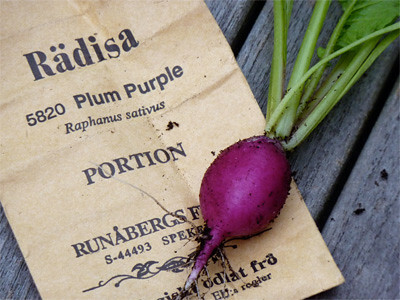 Lucy: I try to plant new radishes every 2-3 weeks or so, as they grow very quickly. WOW! that is an amazing color purple. I could have a dress in that color.